INDIANAPOLIS – Getting the job done on the court is one thing, but more importantly, the work put together in the classroom is what makes a student-athlete a winner. This week, the state associations for boys tennis, volleyball and cross country released their Academic All-State lists. 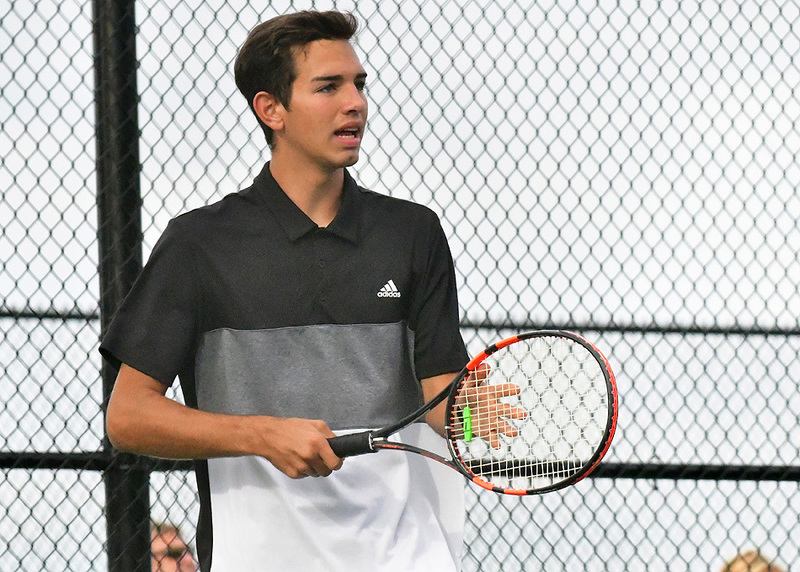 Boys Tennis – Athletes voted in from the Indiana High School Tennis Coaches Association must be a senior, carry a 3.7 grade point average or above, and have scored a 1200 on the SAT or 25 on the ACT. Philip Krabill, Bethany Christian; Freddy Buckingham, Concord; Isaac Miller, Elkhart Christian Academy; Chris Troyer and Mike Troyer, Elkhart Memorial; Aaron Streit, Fairfield; Wes Beck and Axel Brown, Goshen; Josh Bussan, Mishawaka Marian; Dawson Bley, NorthWood; Sid, Das and Alvin Wang, Penn; John Anderson, South Bend Clay; and Thomas Pries, South Bend St. Joe. Jonah Ferran, Bethany Christian; Alex Serwatka and Nate Slabach, Concord; Michael Bender, East Noble; Ben Bontrager-Singer and Diego Torres, Goshen; Mitchell Rose, Plymouth; Lee Ngochi, South Bend Riley; and Jacob Krugman, Wawasee. Cross Country – Athletes voted in from the Indiana Association of Track and Cross Country Coaches must be a junior or senior, carry a 3.5 grade point average or above, and have scored a 1200 on the SAT or 26 on the ACT (seniors) or 1140 on the SAT (juniors). Sam Richards, East Noble; Jessica Corredor-Leon, Elkhart Memorial; Lydia Holsopple, Fairfield; Alison Bache, Northridge; Lauren Schrock, NorthWood; Ellie Jankowski and Anne Loughran, Penn; and Maggie Barrett, Olivia Miller and Bridget Stockrahm, South Bend St. Joe. Clara Lind and Fiona Yeakey, Bethany Christian; Erin Anderson and Lauren Sullivan, Culver Academy; Jeanne Elliott, Adrianna Shepard and Lynsey White, Elkhart Memorial; Whitney Wolfe and Jennifer Martinez, NorthWood; Aislynn Alkire, Penn; Kaitlyn Carothers, Plymouth; Megan Cooper, South Bend Clay; Audrey DeLano and Maeve O’Shaughnessy, South Bend St. Joe; and Remi Beckham and Hanna Bloemendaal, Warsaw. Joe Chandler, Culver Academy; Jack Jansen, East Noble; Neil Terrell, Elkhart Memorial; Demetrius Gulewicz, Sam Miller, Felix Perez-Diener and Jon Snyder, Goshen; Quinten Hunsberger and Jordan Jones, NorthWood; Jaitin Soni and Josh Temeles, Penn; Peter Amat, Joe Deahl, Sam Mark and Oscar Noem, South Bend St. Joe; Liam McGouldrick and Ben Roudebush, Southwood; Anthony Bass and Joe Horoho, Warsaw; Colten Cripe and Nathan Mast, West Noble; and Kent Yoder, Westview. Jobe Kaylor, Argos; Mike Perea, Culver Academy; Chase Grate, East Noble; Richard Hetler, Goshen; Brad Petrofsky and Zack Smaka, Northridge; and Thomas Sheeley, West Noble. Volleyball – Athletes voted in from the Indiana High School Volleyball Coaches Association must be a senior, carry a 3.5 grade point average or above, and have scored a 1100 on the SAT or 24 on the ACT. Caitlin Troxler, Kaelyn Shively and Carly Snyder, Bremen; Meleah Leatherman, Macy Griffis and Brooke Behm, Central Noble; Rebekah Huelsenbeck, Churubusco; Alyssa Kinyanjui, Culver Academy; Grace Erwin, Sara Shultz, Jill Carlson, Alexis Rhoads and Kathryn DeCamp, East Noble; Abigail Hilliard and Abigail Tyler, Elkhart Central; Laney Austin, Elkhart Memorial; Claire Mumaw, Madison Cole and Gabrielle Armstrong, Fairfield; Anna Pope and Cassidy Stose, Jimtown; Charlet Kapke, LaVille; Morgan Smith, Maconaquah; Anna Osbrone, Manchester; Olivia Kuhn, North Miami; Riley Graber, NorthWood; Alyssa Torres, Sophia Cruz and Maria Schwindaman, Penn; Caitlyn Mongosa and Maegan Sinkovics, Peru; Mary Gibson, Kassidy Meiszberg and Carli Derda, South Bend St. Joe; Chloe Finn, South Bend Adams; Shayleigh Shriver, Rachael Randall and Hannah Jansma, Tippecanoe Valley; Kiley Stone, Wabash; and Kacy Bragg, Rachel Yeager, Addie Dickerhoff and Erin Peugh, Warsaw.